Hello all, I am back with a new post that is a TAG post. You might have seen such TAGs done by almost all of the Youtubers. Riya from My Makeup and Beauty Vanity has tagged me to do the ‘This or That tag’. It was so sweet of her. So here are my preferences. Blush or bronzer: blush, because I am not good in contouring! 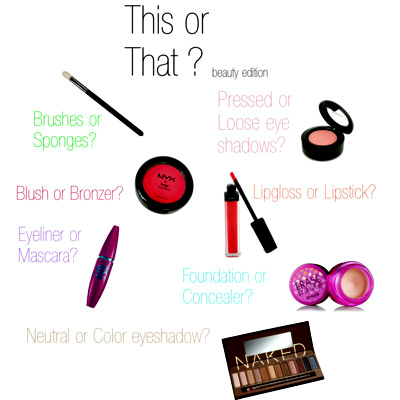 Neutral or color eyeshadow: neutral, but that choice depends on my mood totally! Lush or other bath company: Anything that suits my skin and anything with a nice smell. I am obsessed with things with nice aroma I swear! Jeans or sweat pants: jeans, jeans, jeans! Stripes or plaid: stripes because vertical stripes make me look longer! Scarves or hats: scarves, I need to flaunt my hair!! Forever 21 or Charlotte Ruse: F21 all the way! Curly or straight: Wavy, like I have, but I can’t take my eyes off a person who has nice and healthy straight hair. East coast or west coast: East! Please help this blog grow by following and sharing. Feel free to comment. Thank you!